SuperEBA™ - EBA Cement. 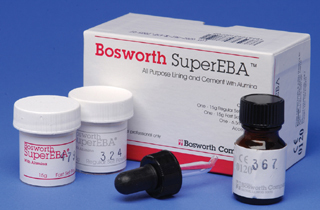 SuperEBA™ is an all-purpose, alumina-fortified material for final cementation of a single crown or inlay, or for use as a base, liner, or a temporary dressing for the relief of pain. SuperEBA™’s neutral pH and mild formulation provide additional patient comfort during the healing process. Hydrophilic nature and low film thickness provide unsurpassed convenience, making it an excellent choice for patients who are easily irritated. Regular set has a long slab set, 10-15 minutes, but a short in the mouth set of 3-6 minutes. The fast set also has a long slab set, 7-10 minutes, but an extremely fast in the mouth set of 45-90 seconds. Film thickness 25 microns. Adheres to tooth structure in the presence of moisture.